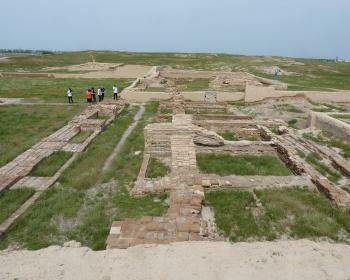 Archaeological sites of Otrar oasis is part of the Tentative list of Kazakhstan in order to qualify for inclusion in the World Heritage List. I visited this tentative WHS in June 2017. It is a very convenient stop between Shymkent and the Khoja Ahmed Yasawi Mausoleum. Most of the locals skip this site and head straight to the Arstanbab Mausoleum as part of their pilgrimage. Solivagant's review is a great detailed walkthrough of what you will see when visiting the Otrar archaeological site. I particularly agree with him when he says: "Otrar is more a place to visit for what it once was rather than to see what it is now". As such it is similar to the 'experience' one gets by visiting Turkmenistan's Nissa WHS. When I visited in June 2017, I was the only soul in the huge archaeological site and I felt as if I had trespassed into an archaeological site where excavations were still underway. There are pieces of broken pottery, tiles and mud bricks scattered everywhere, some partially visible in the mud, exposed after heavy rainfalls. Maybe that is why I felt lucky to be able to visit such a site, as I pictured myself walking on a semi desert mound which could possibly be hiding 'whole structures' like what happened with the Sphinx in Egypt (ok, maybe I had got a sunstroke by the time I finished visiting!). The top left photo shows the remains of the 13th-15th century bathhouse, the top right photo shows the newly reconstructed Gate of Shakhristan, the bottom left photo shows the foundations of residential buildings, a mosque and possibly some fortresses, while the bottom right photo shows the carved remains and scattered pottery with one broken pot stuck in the mud brick walls. All in all, the sheer size of it all and the lack of medieval historical sites in Asia could help Kazakhstan for a possible future inscription, however more archaeological work and less reconstruction have to be done. 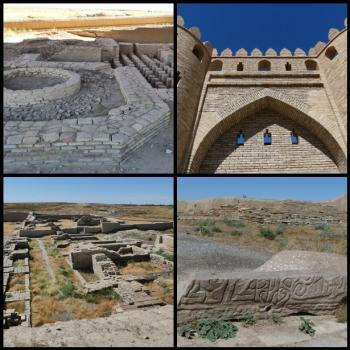 The “Archaeological sites of Otrar Oasis” T List site consists of the remains of 7 ruined towns, together with irrigation structures etc located within a 200 sq km area around the confluence of the Arysi and Syr Darya rivers. Its lowest strata date back to around 1st C BC and it later became an important stop along the Eurasian arm of the Silk Road. At its centre lies the massive mound (200 ha by up to 18m high) of Otrar Tobe (= Tepe/Tell) - the former largest city of the oasis. This is situated in semi desert (in May 2017 it was one of the few places in Kazakhstan where we saw camels!) west off the main road between Shymkent and Turkistan. Most visitors I guess will limit themselves to seeing this main site but the road onwards to Turkistan does pass other tells – with “free” entrance (but with nothing to do but climb them?) and notice boards describing them if you want to stop and read! With a private car it is easy to fit in on a day trip from Shymkent to Turkistan and back – a walking tour of the main part of the mound will take no more than an hour for the non-specialist. A rough path goes first along the bottom of the tell and then climbs up onto it - each point of interest has a bilingual Russian (? )/English notice board/plan. The first point is a Bath House outside the main tell in what has been identified as “residential areas” within a much larger walled compound and dating from the 13th to 15th C. This has been provided with a large steel canopy. A major “problem” for Otrar has been the impact of the climate on the excavated remains - occasional heavy rain and temperatures varying between -20C and +50C. Architectually the bath house didn’t seem of any particular note - a lot of bricks and obvious hypocausts but no decorations or art work. Next is the Gate of Shakhristan (or “inner town” from the late 13th - early 14thC). This was in the process of having the city walls around it stabilised and a full sized (?) “replica” built upon the exposed foundations - its ground plan therefore follows one of the several gates which stood there but, how accurate its external appearance is, may be another matter! Given all the problems with the site, it seemed a rather strange thing to decide to build and one wonders how ICOMOS would regard it if the site ever reaches nomination. Next, up on the tell, is the “Fortress of Shakhristan” (13th - 15th C) - just a few walls, followed by the “Architectural Complex” (14thC). This latter consists of a Jumu’ah Mosque and a “block of flats” (sic!!). Both consisted simply of a series of low brick walls (photo). Other paths then set off to different parts of the Tell but a plan at the entrance had shown that we had seen the main dig areas so we didn’t bother. In all honesty, beyond the impressive size of the Tell itself, Otrar is more a place to visit for what it once was rather than to see what it is now, and also because of the history of its excavation and preservation. Otrar occupies a significant place in Kazakh history and present day national identity. In 1219/20 it was besieged by Genhgis Khan and ultimately “totally destroyed” in what has become known as the “Otrar Catastrophe”. Worse still, the city brought this upon itself as it ruler had earlier massacred the members of a caravan sent by Genghis to develop trade and treaty with the neighbouring Khorezm Empire to whom it belonged at the time. This event is considered to have been the start of the Mongols’ destructive conquest of Central Asia which eventually led west to the gates of Vienna a mere 21 years later – until this time, the story goes, Mongol expansion westward had been largely peaceful and concerned mainly with unifying the Nomadic tribes. Indeed the suggestion is that Genghis would have been happy to stop his expansion at the frontier of the Khorezm Empire if friendly relations could have been achieved. Searches on the Web will find numerous comments like this from Lonely Planet - “Much of the rest of Asia and Europe might have been spared Mongol carnage if Otrar’s Khorezmshah governor had not had Chinggis Khan's merchant-envoys murdered here in 1218”. Hmmm? In fact most descriptions of Otrar’s history after its “total destruction” by Genghis contain a statement somewhat similar to this from Wiki “Otrar city rose again and during the troubled years of civil wars, which followed Genghis Khan's death, the town again became an important political and economic center. By the middle of the 13th century it had returned as a large trade center on the way from the West to the East”! Which takes us to Otrar’s other historic “claim to fame” – in 1405 it was the place where Timur died aged 69 whilst on his way to war in China. His remains were transported to a tomb in Samarkand (rather than to Shakrisabz where he had had his mausoleum constructed) – around 500kms away. Subsequently, Otrar’s ultimate demise was spread out over the next 300 years fuelled by feudal/tribal wars, changing trading patterns and availability of water. It is now 2017 - so - what has happened regarding potential WHS status for Otrar? I have been unable to find anything on the Web mentioning it specifically to indicate either progress or even lack of. In 2014 Kazakhstan gained inscription for 6 of its sites within the overall “Silk Roads: the Routes Network of Chang'an-Tianshan Corridor” inscription. Now Otrar could be regarded as a Silk Road site par excellance, but it doesn’t appear to have ever publicly been considered for inclusion among those considered for this serial nomination. The closest site to it is Kostobe, just east of Teraz with Otrar still another c300kms west as the crow flies. The current Kazakh T List entry for the “Silk Road” (submitted in 2012) contains 23 locations including a duplicate entry for Otrar itself (though whether of the entire oasis or simply of the main “Tobe” is not made clear). Regarding why it might not have been included in the Tian-Shan Corridor nomination - there lies a “soft” natural and cultural boundary to the west of Teraz where grassland and nomadism gives way to semi-desert, irrigation and settled agriculture – the former area was/is called “Zhetysu”. Given the complexity of the chosen nomination running all the way from Chang’an it is hardly surprising that this was chosen as a break point but the Tian Shan nomination file isn’t very clear as to why this Western end point was chosen in the first place. And, if a nomination of Otrar is to be progressed is it likely to be considered in its own right or as a part of some future wider Silk road corridor nomination or even as an extension to the existing corridor? The Almaty Agreement of 2015 specifically mentions agreement to “encourage the close consultation and coordination between Kazakhstan, Kyrgyzstan, Tajikistan and Uzbekistan about the preparation of the Fergana Syrdarya Silk Roads Heritage Corridor World Heritage Nomination process;” This corridor would presumably include Otrar. In Nov 2016 UNESCO reported an “expert meeting” in Kyzylorda Kazakhstan to discus this corridor – “During this meeting, the Secretariat and Working Group in charge of drafting the final version of the nomination dossier shall be elected.” – but no minutes have as yet been published. It would seem to be a matter of “watch this space” with Otrar presumably taking its place among other sites in a future nomination. This would seem the right approach – Otrar just by itself seems too weak in tangible terms.